. . . Head south for the winter that is. We’ve got a bit of a bird/butterfly theme going on in our Central and South American coffees. Since we moved to St. Joseph Island in August 2008, we have really enjoyed watching the birds. We love the chickadees and other birds who stay here all year long . . . but, the colour of the birds who head south for the winter are a joy to see each spring. And, the monarch butterflies are fun to watch, too. We have a lot of milkweed right on our property and have watched the cocoons hatch into beautiful butterflies. Thinking about our fine feathered and winged friends flying or migrating all the way to Central and South America really illustrates how small our world is, and why it’s so important to “Think Globally, Act Locally” . We are happy that all of our green coffee beans come to us Certified Organic, and that any bird or monarch butterfly that visits the coffee plantations we support will not be affected by dangerous chemicals or pesticides. Ironically, there have been no monarch butterflies around St. Joseph Island this summer (2013). 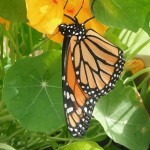 Here is an interesting website that explains things with a little more detail http://www.learner.org/jnorth/monarch/spring2013/update_july.html. There may be a missing generation of monarchs in the works. 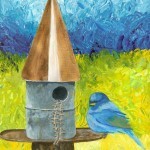 “Indigo Bunting” – Original is acrylic on paper, 8.5 x 11.5 inches © Heather Hoffmann. 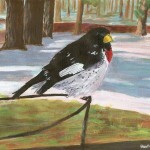 “Rose-Breasted Grosbeak” – Original is acrylic on paper, 8.5 x 11.5 inches, © Heather Hoffmann. Our son released this butterfly after it hatched from its cocoon in 2010. It went straight for the nasturtium in our garden. 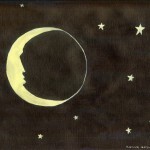 Original is acrylic on paper, 8.5 by 11.5 inches © Heather Hoffmann. And, in the works (in my mind, not yet on paper) is a Scarlet Tanager for our Bolivian label. A couple of days after I decided that the Scarlet Tanager, who flies as far south as Bolivia, would be my next project, a bright red Scarlet Tanager landed on a branch in one of our Maple trees in our front yard. Coincidence? Also of note is our Ethiopian Sidama coffee. Shane has been roasting this Unwashed African coffee for a couple months now. It’s blueberry-licious. Click here for more information on the co-op, and the dry processing method that leads to this delicious fruity coffee. And, last but not least, our New Moon Decaf label is out: The dark side of our decaf collection.